Palm reading or Palmistry (also sometimes known as cheiromancy) is based on the idea that lines on the palm, as well as the shape and construction of the hand and fingers, reveal your character as well as your past and future. With its origins in ancient India, its practice spread throughout Europe and Asia. Modern palmistry is rooted in the mythology of ancient Greece, and at the base of each finger is a 'mound' of Jupiter (the index finger), Saturn (middle finger), Apollo (the ring finger) and Mars (the little finger). There is also a Mercury line and the 'girdle of Venus'. 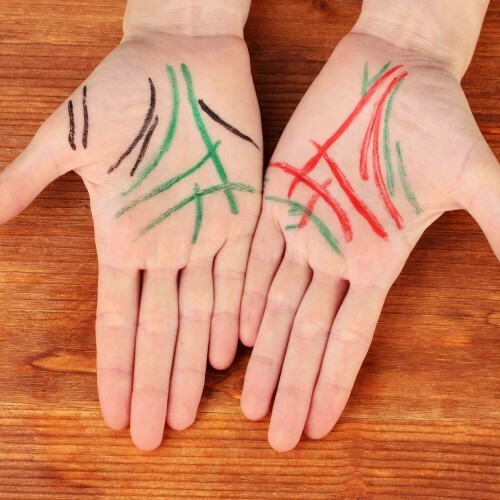 The major lines on the palm are the Life Line, which represents your health and vitality, the Heart Line, which reflects your emotional life and resilience, and the Head Line, which denotes your intellect and communication style. The shape of the hands also relates to temperaments associated with the four classical elements of earth, water, air and fire.